Frequent extreme climate episodes in many parts of the world and increasing global temperatures could negatively impact the production of major staple crops. 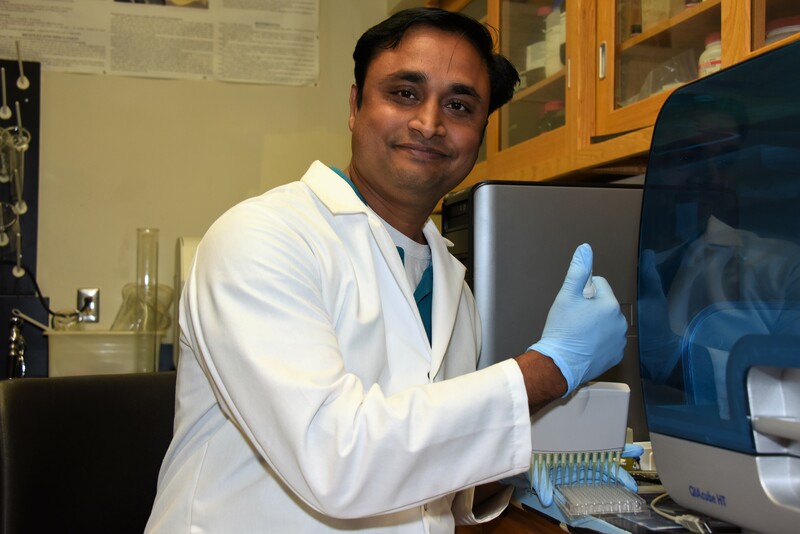 As a result, a team of 65 experts from 30 research institutions, including Fort Valley State University research professional Dr. Somashekhar Punnuri, made a scientific breakthrough that could help enhance crop production despite changes in global temperatures. Punnuri and the international team of scientists decoded and sequenced the pearl millet genome, revealing critical heat coping strategies in this grain crop. They used the latest innovations in DNA sequencing and analysis to identify molecular markers and candidate genes related to drought and heat tolerance, as well as other important traits, such as a better nutrition profile and pest resistance. This discovery, published Sept. 18 in Nature Biotechnology (doi:10.1038/nbt.3943), a monthly research journal covering the science and business of biotechnology, may also help researchers better understand climate adaptation in other important cereal crops. This discovery also led to a better understanding of the pearl millet crop’s genetic variability to survive temperatures greater than 42 degrees Celsius, in addition to its exceptional drought tolerance. Punnuri provided raw genomic marker data for the pearl millet genome sequencing project directed by the International Crops Research Institute for Semi-Arid Tropics (ICRISAT) in India, the Beijing Genomics Institute (BGI) in Shenzhen, China, and the French National Research Institute for Sustainable Development (IRD). “It was a great opportunity for me to participate in this international research project. I feel privileged to be a part of this consortium of distinguished researchers from across the globe,” said Punnuri, who previously participated in an FVSU pearl millet genome research project funded by the U.S. Department of Agriculture’s (USDA) National Institute of Food and Agriculture (NIFA). Professor Rajeev Varshney of ICRISAT, lead author and consortium head, also commended FVSU’s involvement in this project. Pearl millet (Cenchrus americanus (L.) Morrone), a nutritious dryland cereal rich in protein, fiber and essential micronutrients like iron, zinc and folate, is a daily food for more than 90 million people who are among the most vulnerable in arid and semi-arid Africa and Asia. However, investment in genetic research for this smallholder crop has been inadequate, and breeders have limited genetic information to develop high yielding superior varieties and hybrids that respond to farmers’ constraints. Therefore, the team identified candidate genes responsible for important traits like heat tolerance and resistance to downy mildew, a very damaging millet disease. Acknowledging the advances in crop genomic research, Dr. Govind Kannan, dean of FVSU’s College of Agriculture, Family Sciences and Technology, said these developments enable scientists to better appreciate the genetic basis for agronomic and physiological traits. For more information about this project, contact Punnuri at (478) 825-6519 or punnuris@fvsu.edu.